Cassette air conditioners have a low profile. Cassette units work the same way as wall-hung split system units, with the difference being that cassettes are installed into the ceiling instead of on the wall. 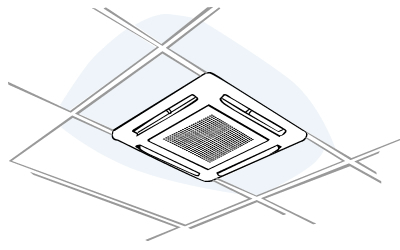 The indoor unit itself sits flush to your ceiling and distributes conditioned air through two, three or four sides of the unit. The outdoor unit of a cassette air conditioner is mounted outside, in much the same way as it would be for a conventional wall mounted split system unit. Cassette units are fairly unobtrusive and come in a range of sizes and capacities, so you have a reasonable amount of freedom when choosing where to install one. Generally speaking, cassette units are more appropriate for larger areas though. Because they take up a fairly large amount of space on the ceiling – and because the ceiling is normally composed of beams and joists, you will need to consult an expert installer to figure out exactly where you can safely mount one. As a general rule, a location that allows for clear, balanced air flow is also suggested for cassette units. The guidelines for installing an outdoor unit for a cassette type air conditioner are the same as those for any other split system air conditioner. Outdoor units should be mounted in stable places where they won’t vibrate, where they have plenty of free space on either side to allow airflow, where they’re easily accessible for maintenance, and where they aren’t likely to be exposed to corrosive substances. Noise should also be considered. The performance of cassette units is generally comparable to that of other types of systems, although because they’re most commonly installed in commercial or office areas, they tend to be more powerful than wall-mounted systems. They are particularly well suited to circumstances where wall-hung split systems or other system types might not be an option. Cassette units tend to be more expensive than other systems.